A couple days late, but I've now updated the Inflation Calculator with August's CPI data. I am now labeling versions of this app by the most recent month of data, so instead of calling this 1.0.6, it's called Aug 2011. I'm putting out another release because Week 1 revealed a few new bugs in the app. Sorry for the multiple releases in 24 hours. Fixed a user-submitted bug where a crash occurred during probability calculation. Not sure what situation caused the crash, but corrected the culpable code. Fixed a bug where no data appears on the magic number screen in certain cases. This most frequently happens in leagues where fewer than 50% of the teams make the playoffs during Week 1, when no team has a large enough lead to have a magic number. 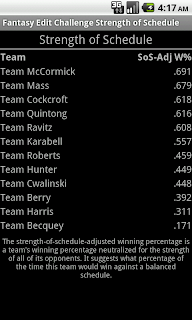 Fixed a bug where week 1 graphs would display the entire season instead of just the single week. Fixed a bug introduced in 2.1 where physical keyboard users pressing the enter button after entering a league URL or league ID would cause a crash when clicking the Get League Info button. This update is now available for both the full version and demo on Android Market. 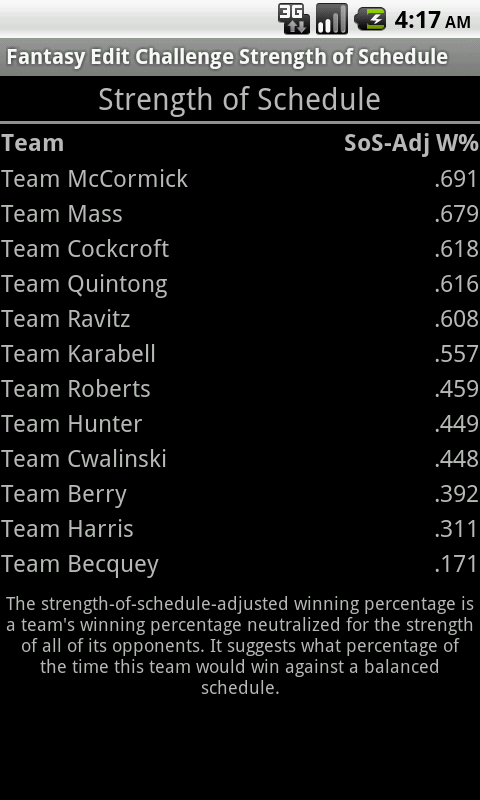 Strength of Schedule added for all leagues: figure out the difficulty of your remaining schedule and who has benefited from an easy schedule. 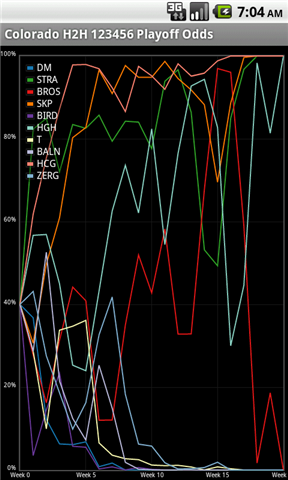 Added touch scrolling to graphs. Disabled magic number menu item for completed seasons. 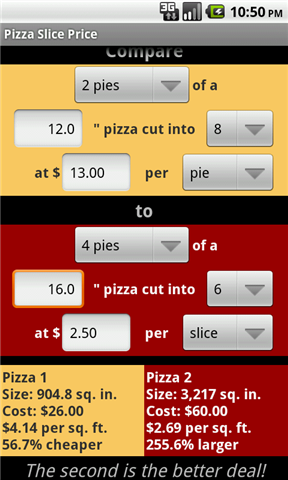 Added support for up to 10 pies. Added detailed display of pizza size and cost. This update is now available on Android Market. New feature time for those of you who don't like looking at tables... graphs! Added probability graphs for playoff, division, and championship odds. Graphs in the free demo contain fewer data points than graphs in the full version. Added option to refresh team names for an existing league through the edit league settings menu. Not applicable to past seasons. Fixed a bug where the predictions would sometimes be sorted incorrectly while simulating, especially mid-simulation. Fixed a bug where the user would initially not be able to scroll to a just-updated week. Fixed a bug where a league waiting to be re-activated would display a "Team settings error" instead of "League has not drafted yet." Fixed a bug where the app might crash while loading team settings data. Fixed a bug introduced in 2.0.1 of the free version where, if a calculation finished while you were looking at a different week, the bottom 3 results would be saved instead of the top 3. The keyboard now closes when clicking the Get Team Settings button.